The Arapaho tribe of Native Americans historically lived on the eastern plains of Colorado and Wyoming, although they originated in the Great Lakes region as relatively peaceful farmers. The Arapaho language is an Algonquian language related to the language of the Gros Ventre people, who are seen as an early offshoot of the Arapaho. After adopting the Plains culture, Arapaho bands separated into two tribes: the Northern Arapaho and Southern Arapaho. They were close allies of the Cheyenne tribe and loosely aligned with the Sioux, fighting with them in the Indian Wars. The expansion of white interests led to the end of their way of life. With their buffalo herds gone and defeated in battle, they were moved to Indian reservations. The Northern Arapaho Nation continue to live with the Eastern Shoshone on the Wind River Reservation in Wyoming. The Southern Arapaho Tribe lives with the Southern Cheyenne in Oklahoma. Together their members are enrolled as a federally recognized tribe, the Cheyenne and Arapaho Tribes. Despite having lost their former way of life, the Arapaho people continue to adapt while maintaining their identity through cultural and educational activities on their reservations, supported by businesses, especially casinos. The origin of the name Arapaho is unclear. It might have come from the Pawnee word tirapihu (or larapihu) for "traders." Alternatively it could be from the Crow name Alappaho, meaning "people with many tatoos." They were also known as hitanwo'iv ("people of the sky" or "cloud people") by their Cheyenne allies. Others called them "dog-eaters." The Arapahos called themselves Hinono-eino or Inuna-ina, which can be translated "our people." Today they also use the word Arapaho (sometimes spelled Arapahoe). There is no direct historical or archaeological evidence to suggest how and when Arapaho bands entered the Plains culture area. Before European expansion into the area in the seventeenth century, the Arapaho Indian tribe most likely lived in the Great Lakes region, in Canada and Minnesota and North Dakota. They migrated westward into South Dakota, Nebraska, Colorado, Wyoming, and Kansas. At that time their large tribe split in two, with the Arapaho traveling west and south, while the Gros Ventre (also known as the A'aninin or Atsina) remained in the north, mostly in the Saskatchewan region of Canada. The Arapaho were originally a sedentary, agricultural people with permanent villages and used dogs to pull travois with their belongings on them. When the Europeans came to North America, the Arapaho saw their horses and realized that they could travel quicker and further with horses instead of dogs. They raided other Indian tribes, primarily the Pawnee and Comanche, to obtain horses and became successful hunters. Their peaceful disposition allowed them to become great traders, and they often sold furs to other tribes. By 1800, the Arapaho had begun coalescing into Northern and Southern groups. 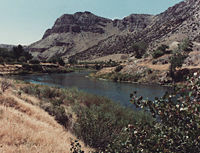 The Northern Arapaho settled in Wyoming, around the North Platte River. The Southern Arapaho settled in Colorado along the Arkansas River. The Northern Arapaho assisted the Northern Cheyenne (who had also separated into two groups) and Lakota in driving the Kiowa and Comanche south from the Northern Plains. Together they were successful hunters and active traders with other tribes. They were prosperous traders until the expansion of American settlers onto their lands after the Civil War. The Arapaho were signers of the Fort Laramie Treaty with the United States in 1851. 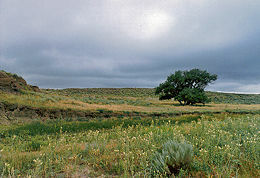 It recognized and guaranteed their rights to traditional lands in portions of Colorado, Kansas, Nebraska, and Wyoming. The US could not enforce the treaty, however, and European-American trespassers overran Indian lands. There were repeated conflicts between settlers and members of the tribes which led to the Indian Wars. The Arapaho were involved in the Indian Wars between the colonial or federal government and various native tribes. The Northern Arapaho together with their allies the Northern Cheyenne fought alongside the Sioux in the northern plains. A band of Northern Arapaho under Chief Black Bear suffered defeat in 1865 at Tongue River during the war for the Bozeman Trail. This loss included not only the slaughter of men, women, and children but also hundreds of horses and ponies, and for a time destroyed the Arapaho capability to raid the Bozeman Trail and overland mail routes. Later, the Northern Arapaho participated in the Battle of the Little Bighorn, also known as "Custer's Last Stand," together with the Sioux and Northern Cheyenne. The Southern Arapaho with the Southern Cheyenne were involved in the conflicts as allies of the Comanche and Kiowa in the southern plains. Southern Arapaho died with Black Kettle's band of Southern Cheyenne at the Sand Creek Massacre. The Northern Arapaho participated in the Battle of the Little Bighorn, also known as "Custer's Last Stand" which occurred in June 1876, near the Little Bighorn River in eastern Montana Territory. It is estimated that population of the encampment of the Cheyenne, Lakota, and Arapaho along the Little Bighorn River was approximately 10,000, which would make it one of the largest gathering of Native Americans in North America in pre-reservation times. This battle was the most famous action of the Great Sioux War of 1876 (also known as the Black Hills War). The U.S. Seventh Cavalry, including the Custer Battalion, a force of 700 men led by George Armstrong Custer, suffered a severe defeat. It was an overwhelming victory for the Lakota, Northern Cheyenne, and Northern Arapaho, who were led by several major war leaders, including Lakota Chief Crazy Horse, and inspired by the visions of Sitting Bull. Site of Sand Creek Massacre - Kiowa County, Colorado. Photo taken December 24, 2006. During November 1864, a small encampment of Southern Cheyenne and Arapaho became the victims of a controversial attack by the Union Army, led by Colonel John Chivington. Later congressional investigations resulted in short-lived U.S. public outcry against the slaughter of the Native Americans. This attack is now known as the Sand Creek Massacre. Eugene Ridgely, a Cheyenne-Northern Arapaho artist, is generally credited with bringing to light the fact that Arapahos were involved with the Massacre. His children, Gail Ridgely, Benjamin Ridgley, and Eugene "Snowball" Ridgely, were instrumental in designating the massacre site as a National Historic Site. The fighting between whites and tribes including the Arapaho continued for several more years before they were finally moved to reservations. 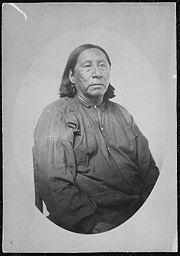 Southern Arapaho chief Little Raven signed the Medicine Lodge Treaty as representative of his people in 1867. This treaty promised the Arapaho a reservation in Kansas, but they disliked the location. In 1869, General Eugene Carr, assisted by William “Buffalo Bill” Cody, finally defeated the Cheyenne and Arapaho at the Battle of Summit Springs, ending their presence in Colorado. The Arapaho accepted a reservation with the Cheyenne in Indian Territory, and both tribes were forced to remove south to Oklahoma. The Northern Arapaho resisted moving to a reservation for longer than their Southern kin. According to the Fort Laramie Treaty of 1868 that ended Red Cloud's War, they were supposed to join the Sioux on the Pine Ridge Reservation in South Dakota, but they refused. They were then told to join the Southern Arapaho in the Indian Territory, but again refused, insisting that they remain in Wyoming. When the Wind River Indian Reservation was established for the Eastern Shoshone in 1868, they agreed to allow Northern Arapaho, their former enemies, to join them. The village of Arapahoe was originally established as a sub-agency to distribute rations to the Arapaho and at one time had a large trading post. 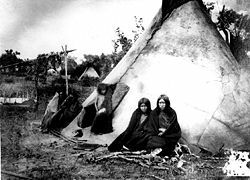 Like other Plains Indians, the Arapaho lived in tipis which the women made from buffalo hide. 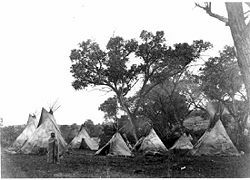 Nomadic people, they moved from place to place following the herds, so they had to design their tipis so that they could be transported easily. It is said that a whole village could pack up their homes and belongings and be ready to leave in only an hour. The Arapaho were great riders and trainers of horses, using them both for hunting buffalo and raiding other tribes and white settlers. In addition to buffalo, they also hunted elk and deer as well as catching fish. They were known to eat their dogs when no other food was available. The children often fished and hunted with their fathers for recreation. They also played many games. In winter the tribe split up into small bands that set up camps sheltered in the foothills of the Rocky Mountains in present-day Colorado. In late spring they moved out onto the Plains into large camps to hunt buffalo gathering for the birthing season. In mid-summer Arapahos traveled into the Parks region of Colorado to hunt mountain herds, returning onto the Plains in late summer to autumn for ceremonies and for collective hunts of herds gathering for the rutting season. In particular, they gathered for the Sun Dance festival at the time of the summer solstice. The Arapaho are a spiritual people, believing in a creator called Be He Teiht. According to Arapaho accounts, the first Pipe Keeper created the earth by taking dirt brought from below the water by the duck and the turtle and putting it on the pipe and blowing it in the four directions. 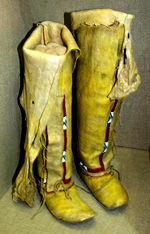 The duck and turtle were then placed into a bundle with the pipe, and the Arapaho have been responsible for them ever since. The Arapaho believe in the close relationship between the land, all creatures, and themselves. Their spiritual beliefs lead them to live in harmony in what they call the "World House," and they place great emphasis on sharing since what a person gives away will come back multiplied many times over. For the Arapaho symbolism is found in everyday activities. In particular, the women painted and crafted designs on clothing and tipis that depicted spiritual beings and tribal legends. The Sun Dance is especially significant, and is an annual ceremony in which they ask for the renewal of nature and future tribal prosperity. An Offerings Lodge is constructed with poles, with a sacred tree trunk at the center around which sacred rituals are performed. It is a test of endurance for participants since they must go without food or sleep for many days. However, Arapaho do not practice the extreme self-torture common among other Plains tribes. 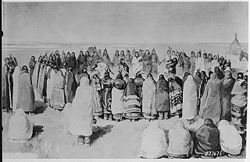 The Arapahos were also active proponents on the Ghost Dance religion in the 1880s, especially those who were relocated to the Wind River Reservation. The Arapaho language (also Arapahoe) is a Plains Algonquian language (an areal rather than genetic grouping) spoken almost entirely by elders in Wyoming. The language, which is in great danger of becoming extinct, has diverged very significantly phonologically from its posited proto-language, Proto-Algonquian. Today, Southern Arapaho live in Oklahoma together with Southern Cheyenne. Northern Arapaho live on the Wind River Indian Reservation in Wyoming. Both tribes face many difficulties on their reservation, including unemployment, alcoholism, and the struggle to maintain their tribal customs and beliefs in contemporary life. The Cheyenne and Arapaho Tribes are a united, federally recognized tribe of Southern Arapaho and Southern Cheyenne people in western Oklahoma. Their tribal government is headquartered in Concho, Oklahoma. The tribe operates several casinos, including the Lucky Star and Feather Warrior Casinos. The Cheyenne and Arapaho Tribal Tribune is the tribe's newspaper. The Cheyenne-Arapaho Tribes of Oklahoma Culture and Heritage Program teaches hand games, powwow dancing and songs, horse care and riding, buffalo management, and Cheyenne and Arapaho language. In partnership with Southwestern Oklahoma State University, the tribe founded the Cheyenne and Arapaho Tribal College on August 25, 2006. Its first president Dr. Henrietta Mann, enrolled tribal member, was inaugurated on April 3, 2008. The campus is in Weatherford, Oklahoma and the school offers programs in Tribal Administration, American Indian Studies, and General Studies. The Northern Arapaho share the Wind River Indian Reservation with the Eastern Shoshone tribes. Located in the central western portion of the U.S. state of Wyoming, it is the seventh-largest Indian reservation by area in the United States, encompassing a land area of more than 2.2 million acres. The reservation is surrounded by the Wind River Mountain Range, Owl Creek Mountains, and the Absaroka Mountains. The 2000 census reported a population of 23,250 inhabitants. Of this population, 6,728 (28.9 percent) were Native Americans (full or part) and of them 54 percent were Arapaho and 30 percent Shoshone. Of the Native American population, 22 percent spoke a language other than English at home. The Northern Arapaho Tribe opened the first casinos in Wyoming when in July of 2005, they won a contentious court battle with the State of Wyoming to get into the gaming or casino industry. The 10th Circuit Court ruled that the State of Wyoming was acting in bad faith when it would not negotiate with the Arapahos for gaming. Today the Arapaho Tribe owns and operates the Wind River Casino, Little Wind Casino, and 789 Smoke Shop & Casino. They are regulated by a Gaming Commission composed of three Tribal members. The Eastern Shoshone also operate a casino on the reservation, Shoshone Rose Casino. Chief Niwot or Left Hand (c. 1825-1864) was a tribal leader of the Arapahoe people and played an important part in the history of Colorado. His people lived along the Front Range often wintering in Boulder Valley, site of the future Boulder, Colorado. Despite breaching the borders of Arapaho territory, early prospectors were welcomed by Niwot in Boulder Valley during the Colorado Gold Rush. Throughout Boulder County, many places are attributed to him or his band of Araphos. The town of Niwot, Colorado, Left Hand Canyon, Niwot Mountain, and Niwot Ridge are all named for him. Niwot died with many of his people at the hands of the Colorado Territory Militia in the Sand Creek Massacre. Chief Little Raven (ca. 1810-1889), negotiated peace between the Southern Arapaho and Cheyenne and the Comanche, Kiowa, and Plains Apache. He secured rights to the Cheyenne-Arapaho Reservation in Indian Territory. 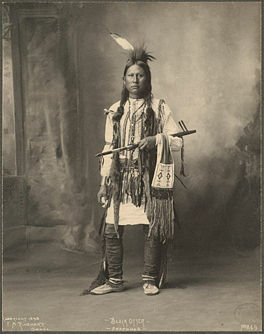 Chief Niwot (Left Hand) (ca. 1840-1911), celebrated warrior and advocate for Arapahos in Washington D.C. He brought the Ghost Dance to the tribe and served as Principal Chief of the Southern Arapaho succeeding Little Raven in 1889. ↑ Cheyenne-Arapaho Lands of Oklahoma Genealogy, Cheyenne-Arapaho Lands of Oklahoma: Oklahoma Arapaho. Retrieved October 25, 2011. ↑ 2.0 2.1 Ethel Taylor, Arapaho (2003). Retrieved October 24, 2011. ↑ 3.0 3.1 3.2 Carl Waldman, Encyclopedia of Native American Tribes (New York, NY: Checkmark Books, 2006, ISBN 978-0816062744). ↑ 4.0 4.1 Fowler, Loretta. Arapaho, Southern., Oklahoma Historical Society's Encyclopedia of Oklahoma History & Culture. Retrieved October 20, 2011. ↑ Robert M. Utley and Wilcomb E. Washburn, Indian Wars (New York, NY: American Heritage Press, 2002, ISBN 978-0828102025). ↑ Kathy Weiser, Arapaho - Great Buffalo Hunters of the Plains Legends of America, 2010. Retrieved October 5, 2011. ↑ Margaret Coel, Arapaho Facts, Traditions & Beliefs Retrieved October 17, 2011. ↑ The Cheyenne and Arapaho Tribal Tribune Cheyenne & Arapaho Tribes. 2010. Retrieved October 20, 2011. ↑ Culture. Cheyenne & Arapaho Tribes (2010). Retrieved October 20, 2011. ↑ General Information. Cheyenne and Arapaho Tribal College. Retrieved October 20, 2011. ↑ Wind River Indian Reservation Retrieved October 20, 2011. ↑ 12.0 12.1 2000 Census, U.S. Census Bureau Retrieved October 20, 2011. ↑ Casinos Wind River Indian Reservation. Retrieved October 20, 2011. ↑ May, Jon D. Little Raven (ca. 1810-1889). Oklahoma Historical Society's Encyclopedia of Oklahoma History & Culture. Retrieved October 20, 2011. ↑ May, Jon D. Left Hand (ca. 1840-1911). Oklahoma Historical Society's Encyclopedia of Oklahoma History & Culture. Retrieved October 20, 2011. ↑ Wyoming Citizen of the Century Nominee Sherman Coolidge University of Wyoming American Heritage Center. Retrieved October 20, 2011. Weiser, Kathy. Arapaho - Great Buffalo Hunters of the Plains Legends of America, 2010. Retrieved October 5, 2011. This page was last modified on 22 November 2016, at 21:13.